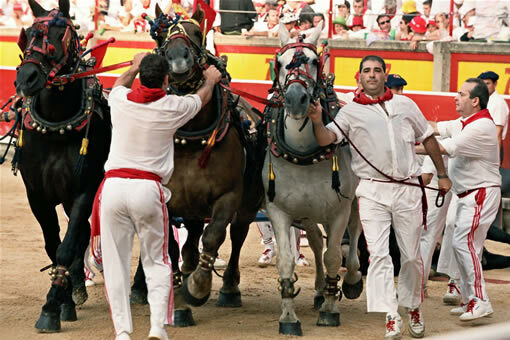 Also known as the Parade of mounted bullfighters, this is a spectacular procession of horsemen, dressed in black and wearing capes, followed by teams of mules with their drivers and the municipal brass band La Pamplonesa. To the tune of a pasodoble, the parade makes its way through the streets of the Old Part to the Bullring shortly before the start of the fight. Custom sets the protocol for this act. Every afternoon from the 7th to the 14th July, the horsemen, dressed as 17th century Alguaciles (constables), and the rest of the retinue, meet minutes before 5.30 pm at the Casa Marceliano bar on the Calle del Mercado street. Shortly afterwards, the procession leaves the town hall square on time. The horsemen lead the way, followed by two teams of three mules decorated with coloured ribbons and bells, accompanied by 14 mule drivers. The Pamplonesa brass band follows on behind, all watched by a crowd of onlookers. The parade goes through the streets of Mercaderes, Chapitela, Plaza del Castillo and Espoz y Mina. Along the way, the procession is joined by the Peñas (San Fermin social clubs) with their noisy street bands. On reaching the bullring the group divides up: horsemen and mules enter through the door leading to the horse patio, accessed via the Paseo de Hemingway, whilst the municipal band "La Pamplonesa" enters via the upper seats in the shade, one of the normal entrances to the bullring. Once inside, the mounted constables first make the traditional entry into the arena to check that the ring is clear, after being authorised to do so. They then return to the horse patio to re-enter the ring at the head of the bullfighters and their teams in order to make the parade or grand entry - known as the "paseíllo". Pamplona was one of the first bullrings to use teams of mules to drag the dead bulls away after the fight. Already on 10th July 1628, the mule drivers dressed in the city's livery, brought three mules out into the ring. In the 17th century teams of mules replaced the carts which were used for carrying the dead bulls or lancer's horses. The constables are under the orders of the President of the bullfight, and have duties as assistant bullfighters. In addition to the tradition of clearing the ring before the fight, there is also the initial ceremony of being given the keys to the bull pen. 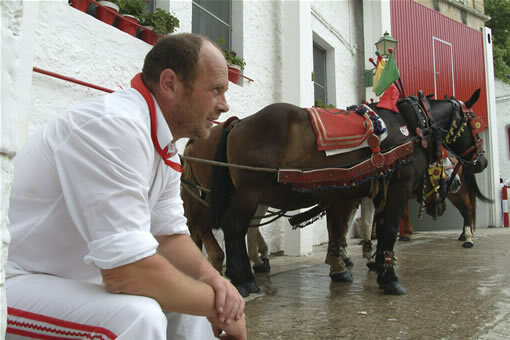 In this way, although the origins of the "parade of mounted bullfighters" is not known, some Fiesta experts relate it to the tradition linking the town hall councillors with the presidency of the bull fights.